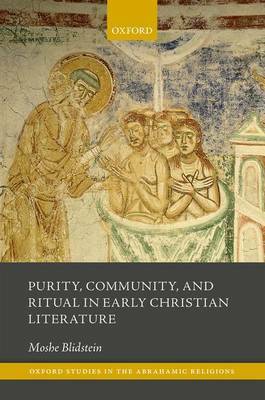 Purity, Community, and Ritual in Early Christian Literature investigates the meaning of purity, purification, defilement, and disgust for Christian writers, readers, and listeners from the first to third centuries. Anthropological and sociological works over the past decades have demonstrated how purity and defilement rituals, practices, and discourses harness the power of a raw emotion in order to shape and manipulate cultural structures. Moshe Blidstein builds on such theories to explain how early Christian writers drew on ancient Jewish and Greco-Roman traditions on purity and defilement, using them to create new types of community, form Christian identity, and articulate the relationship between body, sin, and ritual. Blidstein discusses early Christian purity issues under several headings: dietary law, death defilement, purity of the heart, defilement of outsiders, and purity of the community. Analysis of the motivations shaping the development of each area of discourse reveals two major considerations: polemical and substantive. Thus, Christian writing on dietary law and death defilement is essentially polemical, constructing Christian identity by marking the purity practices and beliefs of others as false. Concerning the subjects of baptism, eucharist, and penance, however, the discourse turns inwards and becomes more substantive, seeking to create and maintain theories of ritual and human nature coherent with the theological principles of the new religion.